Welcome to DiamondsHere.com bracelets page! 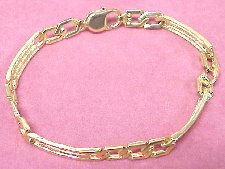 At DiamondsHere.com we use only the finest precious metals for our bracelets - all are constructed in heavy-weight castings and ALL MOUNTINGS ARE SOLD TO YOU BY THEIR ACTUAL GOLD WEIGHT! You will not be disappointed with a purchase from DiamondsHere.com...our gemstones are of the finest colors available. . . and we offer you a 100% satisfaction guarantee or your money back! Call us with any questions or special requests you may have and order with confidence . . . DiamondsHere.com hours...OPEN 6 DAYS A WEEK 9:00 a.m. to 5:30 p.m. (Pacific Time). Many of our bracelets are one of a kind so please call us with your needs! At DiamondsHere.com, we maintain a fashion forward inventory of stunning bracelet styles from 1 carat to 20 carat diamond weight! 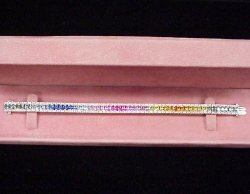 Check out our beautiful Rainbow of Sapphires (tm) ladies bracelet. Each sapphire is cut to perfect baguette specs. and your bracelet will contain 12.0 carats representing the color spectrum. To accent your sapphires we have added 2.75CT TW of diamonds, set in lovely 18KW gold with a double clasp and main safety catch. 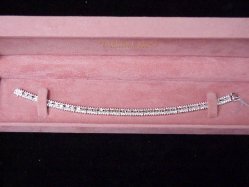 5.64CT TW 18KW Diamond Tennis Bracelet. WOW! This sure will catch your eye. Consisting of 204 round brilliant diamonds (3.37CT TW) and 38 baguettes (2.27CT TW) of G/H Color, VS-SI Clarity, indiviually set in 18KW gold and double safety clasp for extra protection. Don't miss out on this unique and stunning piece of fine jewelry. If you have a style and carat weight in mind for your diamond bracelet... give us a call! We offer huge cash discount prices and 48 hour delivery!!! Your satisfaction is guaranteed at DiamondsHere...AND...NO SALES TAX IN OREGON!